June 30, 2010  Larry King announced Tuesday that he's leaving his prime-time slot on CNN. His show was losing viewers at an alarming rate, as CNN itself has lost a lot of audience share to its cable news rivals. Now the network will try to find a fresh approach to its prime-time lineup. June 30, 2010  Iraqis look to television for political information more than any other medum, but at the same time don't trust what they see, new studies show. There are no neutral outlets. Broadcasts are funded by ethnic political parties, Islamists, business interests and the government. June 30, 2010  Larry King says he's stepping down this fall from the prime-time show that has anchored CNN's lineup for 25 years. 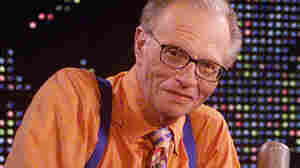 Larry King Live has been suffering in the ratings recently, and there's been speculation about King's future. June 29, 2010  Researchers say people over 65 watch three times more TV than younger adults. Yet older people enjoy their viewing far less. June 23, 2010  The star of the football drama Friday Night Lights discusses her role on the NBC series with Fresh Air contributor David Bianculli. Britton explains why she likes playing Tami Taylor, how she prepares for her scenes — and speculates on when the Texas epic will finally end. June 21, 2010  The season one finale ends with both a joyful bang and a painful whimper. But in New Orleans, the former is hard to contain for too long. Josh Jackson breaks down the star-studded songbook and the messages it leaves behind. June 18, 2010  In this installment of the Barbershop host Michel Martin talks with freelance writer and author Jimi Izrael, syndicated columnist Ruben Navarrette, civil rights attorney Arsalan Iftikhar and Sports Illustrated reporter Pablo Torre. They discuss the epic Game 7 in the NBA between the Los Angeles Lakers and the Boston Celtics. Other topics include the World Cup, and Iowa Republican Congressman Steve King's comments that President Obama favors black people. June 14, 2010  Even in New Orleans, it's a constant struggle to create art. 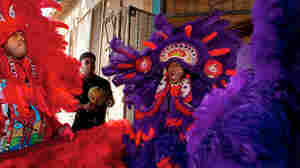 And in post-Katrina New Orleans, a lot of things compounded that strife. WBGO's Josh Jackson recaps the episode's soundtrack to a painful plot twist. June 14, 2010  Older kids and boys spend the most time in front of the TV. Parents who knew that experts recommend less than two hours per day of TV for kids were more likely to enforce rules, a study finds. June 11, 2010  Tim Conway's career stretches from sitcoms in the 1960s to a dozen Disney films and 11 years on The Carol Burnett Show. Last year he won his sixth Emmy for a guest spot on 30 Rock. The 78-year-old legend says he enjoys being funny -- a clean, family-friendly kind of funny. June 11, 2010  Tension is growing on the border between El Paso, Texas, and Ciudad Juarez, Mexico. An American border agent shot and killed a Mexican teen, who was reportedly throwing rocks. Cell phone video that contains vivid pictures of the shooting has been broadcast by Univision. June 11, 2010  The A-Team doesn't survive the transition from semi-beloved '80s TV series to 21st-century action movie. Exotic explosions, cascading cars and other excesses turn director Joe Carnahan's adaptation into a chaotic feature-length trailer. June 9, 2010  The genius, if antisocial, protagonist of the Fox series House uses a barrage of cutting-edge tests and procedures to help diagnose his puzzling patients. But how much does that actually cost? We take a close look at one episode to find out. June 9, 2010  HBO's vampire series True Blood returns with its third season Sunday. TV critic David Bianculli says the series is different from other vampire dramas appearing on screen these days -- including the phenomenally popular Twilight movie series. For the most part, he says, it's not about denial and restraint. It's about giving in.